Creating a place for AMA members and associates to connect with one another was part of the Multihousing Friends dream from the very beginning. With our exclusive members-only AMA Forum, users have a unique way to chat and share information with one another online. Best of all, you don’t have to worry about the clutter of other social networks or mixing your business contacts with your personal life. Our forums are simple, straightforward and easy to use. It really is like an online trade show. Each forum and sub-forum give you the option to subscribe to that particular topic. Clicking this link will subscribe you to the forum or sub-forum, which means you will receive email notifications each time someone creates a post there. This is particularly useful for associate members who want to be among the first to reply to questions or other posts in their area of expertise. Hiring managers and corporate recruiters rejoice! 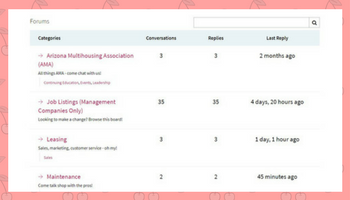 The forums feature a members-only job board for posting open positions. Posting is free and unlimited. In addition to community-sourced postings, our own MHF staff occasionally posts jobs we find online and monitors the listings to ensure freshness. 4. Join in the discussions! It may sound obvious, but one of the best ways to be involved on the forums is to make your presence known and just jump into the conversation. Answer questions or share posts and links. Don’t be a lurker! We're here to help! Stay tuned for official announcements, articles and other great content!